Hello, my name is The Six Million Dollar Scholar, and I would like to share with you this most amazing playbill. That title is the closest I’ll ever get to appearing on Broadway, so humor me. I’ve been coming to New York City for years and years, but somehow I’ve never seen a show. I’ve seen Broadway shows in North Carolina and Philadelphia, but had always heard that it’s just not the same as seeing them on the Great White Way. My mother—living saint that she is—decided that it’s time we did something about it. I made a choice not to do my homework in preparation for this show. The premise of the show makes me uncomfortable, but I’d heard it was the funniest show on Broadway, and it’s passed the sniff test of several critical thinkers that I have the privilege of calling my friends. I wanted to see how the show hit me, and there’s really only one way to make that happen. So, the following is my personal opinion of and meditation on the show. It’s been twenty four hours. There’s nothing I can possibly say about the show that’s more profound than what’s already been written by other people. Still. 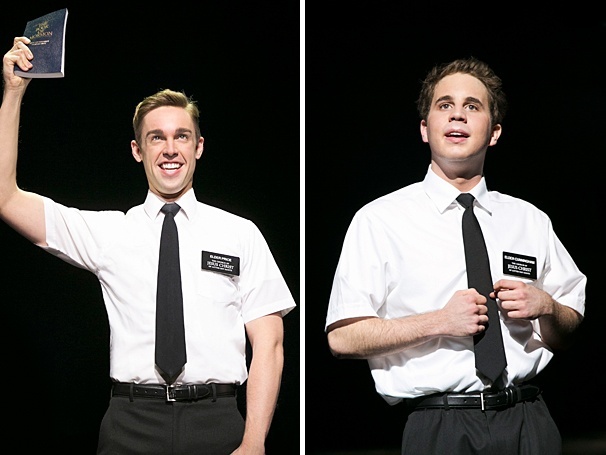 Nic Rouleau and Ben Platt, the two HUGELY talented stars of “The Book of Mormon.” Most of the pictures on the net are of the original cast, but I can’t imagine anyone being better than these two were. Let’s get one thing out of the way now: this show is really beautifully written and performed. I am in awe of the men and women I saw on that stage, and have nothing but respect for each and every one of them. Their art needs to be considered a thing in itself, and there is no need for meditation there. This is hands-down one of the best shows I’ve ever seen, and if I had the time, money, and social graces to take every member of the cast out to lunch, I totally would. They put on one a hell of a show. “The Book of Mormon” is also a show that I can 100% understand my Mormon friends despising. That having been said, the structure of the show is such that any religion that promotes proselytizing could fit squarely in its crosshairs. Mormonism drew the short straw, but the abuse it takes is not nearly as heinous as I’d anticipated. The play mocks details of the faith, but ultimately looks beyond them to highlight all that is good about having faith. It’s a show that, in a hilariously roundabout way, demonstrates that anything is possible when you tap into a higher power, even if that higher power is a hobbit. It does, however, accomplish that at the expense of a major religion, and I appreciate that many a Mormon would find this play hurtful. My other major concern going into the show was the fact that two white guys sat down and wrote a musical set in Uganda. I was expecting a lot of cheap-shot racial humor, and to a certain extent I got it. The African characters in this play are a bit two dimensional, and a huge portion of the plot is dependent upon their naiveté and lemming-like willingness to adopt (a creatively edited version of) Mormonism. However, I came away from the show feeling okay about the way people of color are represented, because—no spoilers—the writing is designed to make the audience “realize” the complexity of the African characters right alongside our two white protagonists. This enables a critique of neoliberal racism and global capitalism that might not otherwise translate to a broad audience. Like South Park, I suspect that “The Book of Mormon” has and will to continue to fly over the heads of many people, and to a certain extent I can understand the point of view that that risk associated with this brand of humor outweighs its rewards. But I believe in taking risks, and I believe that with every show “The Book of Mormon” is engaging at least a few privileged young people who love volunteer tourism, don’t believe ours is an imperialist country, and quiver at the thought of “anti-racist social justice.” These folks might not realize they’re laughing at themselves, but they are. This show may only open their minds for a couple of hours, but that’s something. Or maybe I’m full of it. I don’t know. Fact is, I love and support musical theater, and I would have an exceedingly hard time tearing down a show that’s so expertly constructed and performed. It’s also hard to dump on a play that made me laugh out loud about AIDS after a day spent reading obituaries. Maybe I’m rationalizing, but I honestly don’t think so. So yes, “The Book of Mormon” is definitely not for the easily offended, and only for the most lighthearted of LDS folks (like, maybe 1% of you), but it is a wonderful show. You should chop off an arm and a leg (it’s that expensive) and go see it, if only to jump onto my comments page and tell me how wrong I am, and how much you miss the aforementioned limbs.